A 2003 report by Ken Clarke argued that a Supremacy Act, similar to the UK Sovereignty Act proposed today, would be "fundamentally incompatible" with EU membership. 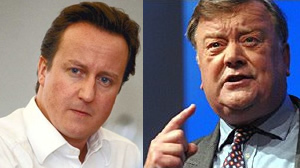 A 2003 report by Ken Clarke argued that a Supremacy Act, similar to the UK Sovereignty Act proposed today by David Cameron, would be “fundamentally incompatible” with EU membership and a “recipe for anarchy”. “Throughout our eighteen years in Government, we always accepted that the European Union could not possibly work without its law taking priority over national laws within its own competence. There has never been any serious doubt that for us to purport to reverse this principle by an Act of Parliament would be fundamentally incompatible with our continued membership of the Union, and would be taken as an immediate signal of our withdrawal from full membership. “Ideas such as a ‘supremacy act’ asserting the superiority of British law or giving the British courts the power to overrule judgements of the European Court of Justice undermine one of the fundamentals of the European Union – the universal application of EU law which actually needs to be strengthened in some areas to ensure that every State obeys the rules. Germany asserts that its courts and legislature can overturn or overrule EU laws. It seems to still be a member. @unseen – in theory, yes, in practice it has never been tested at all. The single market without supremacy of EU law doesn’t work. Absolutely – and the Sovereignty act doesn’t question the supremacy of EU law once it’s been drawn up and agreed across 27 members states. All Cameron’s proposal does is force any UK government embarking on that road to seek approval via a referendum. Still much to criticise there and questions about whether it’s workable but absolutely nothing in this post or Clarke’s response to today’s announcement which demonstrates a sovereignty act is incompatible with EU membership. And there’s more in the report if you download it (link above). Well done for finding that Clarke report – no wonder he’s been pulling out of previously scheduled media events to avoid being called on it. However I think Unseen and Jon are right – Cameron can pass any law he likes to pander to the Eurosceptics – however we will only break our treaty commitments by taking concrete actions that violate them and I very much doubt a) that he will risk doing so or that b) if he did the relevant EU bodies will do anything much about it. Italy for example is in radical breach of several economic commitments it entered into as part of the Eurozone – but as there is no practical prospect of them being able to reduce their budget deficits by anything like the requisite amounts for at least a decade nobody is talking about expelling them. In fact if I read http://www.bloomberg.com/apps/news?pid=20601100&sid=aZm98qFimxBc correctly no fewer than 18 of the EU27 are either currently in breach of the 3% of GDP deficit limit set by the stability pact or will be shortly. Whether this constitutes an actual breach of treaty obligations by two-thirds of the EU I’ll leave to someone more expert than me to indicate. I think the trouble here is that Cameron has been quite vague about what this National Sovereignty Act would do. From what I heard in the speech it would not do the things Ken Clarke rightly objected to in 2003 – although Cameron did imply at one point it would somehow stop judicial activism in the ECJ. I don’t see how it can possibly work to achieve that. My understanding is he’s simply trying to replicate the position under the German constitution – which is fine, but then the existing constitutional position is already equivalent to that in Germany. It is the UK courts which rule on all law in this country (applying ECJ case law where appropriate, as the German courts do); they have in the past been called on to consider the lawfulness of the UK’s signing up to further EU integration, just as the German courts have. And Parliament can theoretically overrule EU law internally, just as Germany can. The reason neither does in practice (Jon is quite right – Germany hasn’t done so and its Constitutional Court has said it will not do so as long as the EU continues to respect human rights – which is one reason why Germans and others like the Charter) is that each has accepted Treaty obligations to comply with EU law, and to refuse to do so is not politically compatible with EU membership. Cameron’s bill would I think, at most, be a “clarification” of the existing position.